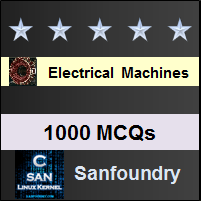 This set of Electrical Machines Multiple Choice Questions & Answers (MCQs) focuses on “Synchronous Machine Stability”. Explanation: Steady state analysis involves study of stability at gradual changes in the machine. Explanation: Because load angle is more than 90°. Explanation: Steady state limit = EV/X. Explanation: Transient stability is more of concern due to the reason that the machine may loose synchronism due to sudden disturbances. Explanation: Both are correct statements. 7. The supply voltage to an induction motor is decreased by 10%. By what percentage, approximately, will the maximum torque decrease? Explanation: Torque is proportional to V^2. Torque will change by twice percentage of the change in voltage i.e. 20%. 8. In a salient pole synchronous machine the air gap is least under the middle of the pole shoe and increases outwards. Explanation: Air gap for a salient pole structure is minimum at mid of a given pole. 9. If it is planned to bring an incoming alternator to the operating alternator in parallel, then which of the criteria can be ignored? Explanation: To operate under synchronising conditions, there must be same voltage, frequency and phase sequence for the machines in the parallel. 10. Which one of the following is the base reason to place field on rotor in the alternator? Explanation: Providing insulation becomes easier as the stator will be stationary.